This pink and green CHARM IT! snail charm with a heart-covered shell likes to take it slow. 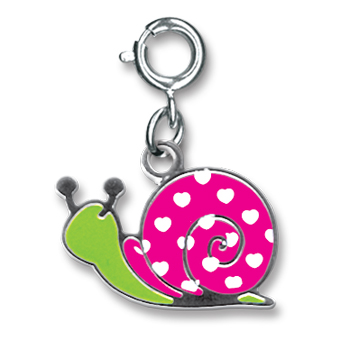 With a green enamel body with a hot pink enamel shell covered in white hearts, this snail charm is a delightful addition to any charm collection, especially for that lovable slowpoke in your life. With a simple snap of a clasp, girls can personalize their CHARM IT! jewelry with this fun CHARM IT! snail charm.